Bicycle Thieves (Italian: Ladri di biciclette; originally titled The Bicycle Thief in the United States) is a 1948 film directed by Vittorio De Sica. 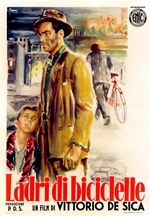 The film follows the story of a poor father searching post-World War II Rome for his stolen bicycle, without which he will lose the job which was to be the salvation of his young family. 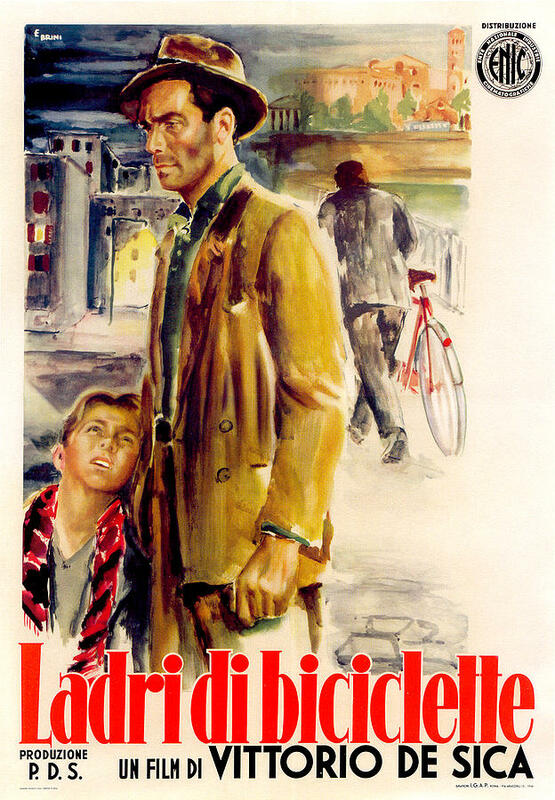 Adapted for the screen by Cesare Zavattini from a novel by Luigi Bartolini, and starring Lamberto Maggiorani as the desperate father and Enzo Staiola as his plucky young son, Bicycle Thieves is one of the masterpieces of Italian neorealism. It received an Academy Honorary Award in 1950 and, just four years after its release, was deemed the greatest film of all time by Sight & Sound magazine's poll of filmmakers and critics; fifty years later the same poll ranked it sixth among greatest-ever films. It is also one of the top ten among the British Film Institute's list of films you should see by the age of 14.